When it comes to being a top choice in the sedan market, the 2017 Toyota Camry has been swinging for the bleachers for more than 30 years. Introduced all the way back in 1983 to replace the aging Corona, the Camry has continued to be one of Toyota’s best-selling and most iconic vehicles, facing its latest redesign for the 2015 model year. As one of Toyota’s best-selling nameplates, the Camry has subsequently been spun into an astounding seven different trim levels, each with its own technology additions, engine options, and styling adjustments. 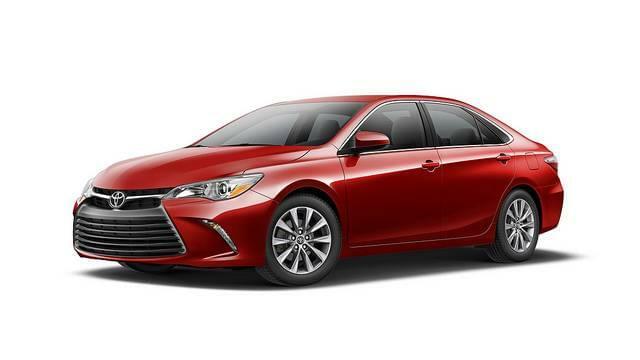 For the most basic Camry, try the LE trim, starting at $23,070 and offering a Standard backup camera and a 2.5-liter four-cylinder engine. Or, spin all the way up the top with the Hybrid XLE trim, with its leather-trimmed multi-stage heated seats and 2.5-liter ECVT Hybrid engine. Speaking of the Hybrid engine, the Camry inherits the brand’s long-standing hybrid prowess and uses it to balance power and fuel efficiency. Using Hybrid Synergy Drive, the combination of electric motor and gas engine produces 200 hp and 156 lb-ft of torque, while sipping fuel with an efficiency rating of up to 42 mpg in the city and 38 mpg on the highway.